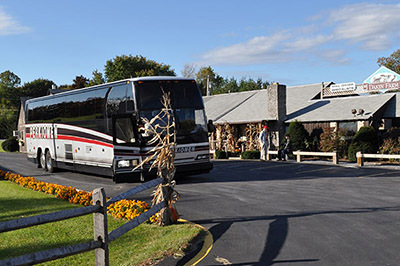 Dakin Farm welcomes group tours year-round at our Ferrsiburgh location — with two large parking lots, we can easily accommodate tour buses. Group tours are FREE. Please call to make a reservation: 1.800.99.DAKIN. After being greeted upon arrival, the group will have the opportunity to watch our newly filmed Dakin Farm Story (approximately 9 minutes) in our new, air-conditioned theater before taking a walk around our 6,000 square foot retail store, where they can enjoy plentiful samples and find a piece of Vermont to take home. We then welcome the group to step into our Sugarhouse where they can see our King Style Maple Syrup Evaporator and a display of tools used to collect sap, dating back to the 1800’s. View photo collages, maple sugar equipment, rotating images of Maple Sugaring in Vermont and a short video about the history of maple syrup. Make sure to take a look into our USDA-inspected smokehouse where you might get to see racks of sausage coming out of the smoker or our Master Smoker, Bob, perform his craft of maple-glazing and spiral-slicing hams. On certain days, guests can even view one of our staff members hand waxing select Dakin Farm cheese.